David Herbert Richards Lawrence was born in Eastwood, Nottinghamshire, the son of a coal-miner. Sons and Lovers (1913), Lawrence’s third novel, reflects his early experience of a divided home and a possessive mother. He was educated at Nottingham High School and Nottingham University College, and he worked for a time as a schoolmaster. His first novel, The White Peacock (1911), was immature but impressive, and he gradually found recognition and friends in literary London. He planned a new novel, to be original in method and approach to character: provisionally called ‘The Sisters’, this developed into two books, The Rainbow (1915) and Women in Love (written in 1916). The first edition of The Rainbow, considered obscene by most reviewers, was destroyed by court-order. 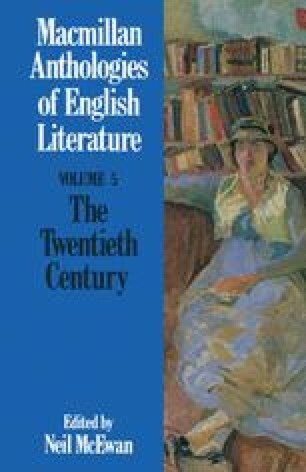 Undeterred, Lawrence wrote and rewrote Women in Love (1921), the most original and effective expression of his ideas of truth to one’s own manhood or womanhood. With his German wife Frieda, he travelled abroad after the war, moving from Florence and Sicily to Ceylon, Australia and New Mexico. In later novels such as The Plumed Serpent (1926) and Lady Chatterley’s Lover, not published unexpurgated in England until 1960, he continued to write with a passionate confidence in his personal vision of life. Books of poems included Look! We Have Come Through! (1917), Birds, Beasts and Flowers (1923) and Pansies (1929).